It's important when starting a cult to have an awe-inspiring if not somewhat frightening look. That way, once you start building an army of devotees, they'll be ready to obey your every command! Your boys of war will be loyal and true and all they'll ask of you is to help them ride eternal to the gates of Valhalla. The road's a little bumpy, so outfit your costume with this mask. You're sure to be witnessed on any road trip! 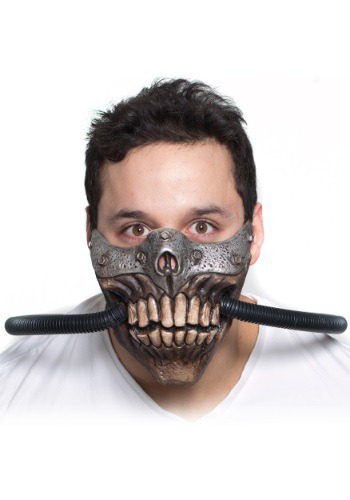 Pair this mask with a weathered-looking blond wig for that windblown villain look. Be sure to enjoy the journey, they say getting there is half the fun! Just be sure to embrace your rotund shape, you can always shape yourself with an odd clear muscle mold, then people are sure to respect every ounce of your mass. This mask is intimidating with skeletal teeth, breathing tubes for avoiding all the sand from your journey, and a metal border to make it more comfortable. It straps to the back of your head for a comfortable yet evil look!